While taking my morning walk last Saturday, I came upon a startling sight: A hornet’s nest lying in the road, brought down by a storm the previous. As I note in the screen capture, hornet’s nest figure in both THE BALLAD OF ALEJANDRO LOPEZ and SOFTBALL IS LIFE. In the former, a young boy’s pitching prowess is discovered when he hurls a rock through a hornet’s nest. In the latter, a high school principal tries to solve two problems at once — the softball coach refuses to recognize a girl’s throwing skills, and the neighboring landlord refuses to remove a hornet’s nest near the school grounds. You can probably guess how that goes. 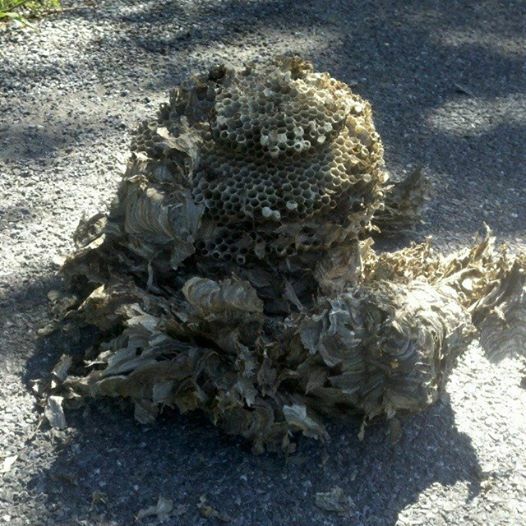 A hornet’s nest, fallen from the sky! Or, at least a tree.